Who doesn’t love Comfort Food? Personally, I’m always in the mood for comfort food, whether summer or winter…bring it on! In her February 2018 published 122 page cookbook, Chef and author Julia Bettelheim includes recipes which at first glance appear to range in preparation and skill from simple to technical. However, most of the recipes require some background cooking knowledge and certain ingredients are not listed in specific details. 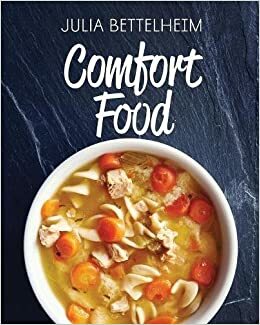 The book contains main dishes, soups, salads, and desserts, all of which could be considered comforting food. Additionally, Bettelheim includes recipes specific to England, Ireland, Scotland, and Wales. Due to this, however, some of the ingredients used in the recipes may not be readily available in the states. In summary, this is a still a good choice of cookbook for its variety of recipe types and would make a great gift for food lovers who like to branch out and try international recipes. Thank you to Clink Street Publishing for providing me with a review copy of this title in exchange for an honest reivew. There’s nothing quite like Comfort Food to put a smile on your face and a feeling of contentment in your stomach. Chef Julia Bettelheim is passionate about feeding people; from the students in her university kitchen to guests and family at home. From recipes that are as simple as a sandwich to as technical as a fruit cake, she knows the importance of creating delicious meals that are full of flavour and which always have budget in mind. Her recipes include easy to make classics and mouth-watering family favourites, using easy to find products that are fresh and economical. Fun, fast, indulgent and nurturing, there’s a time and a place for Comfort Food in every kitchen. For many years, I’ve been a huge fan of The Pioneer Woman, Ree Drummond’s recipes and truly enjoyed her cookbooks. The Pioneer Woman Cooks Dinnertime is t he best cookbook to date. The reason I love it so much is that it is mostly main dish dinner recipes, rather than a bunch of recipes for appetizers, desserts, drinks, etc. I am always looking for new dinner recipes; and this cookbook has some awesome ones. All the recipes are simple and step-by-step with photos of each step, which make it easy on the cook. Woven throughout the cookbook are stories and anecdotes from Ree’s family life on the ranch. There are stories about where recipes originated, notes about which family member likes which ones the best, as well as pictures of Ree’s children and even the ranch dog. The photography is beautiful and really makes this a treasure of a book. Categories of recipes include: Breakfast for Dinner, Soup for Dinner, Salad for Dinner, Freezer Food (make ahead meals! ), 16 Minute Meals, Pasta Pronto, Comfort Classics (my favorite! ), New Favorites, Veggie Sides, Starchy Sides, and Quick Desserts. The back of the book includes a “Recipes for Everyone” section in which the recipes are organized into categories such as “kid-friendly,” which is helpful to moms (like me!) cooking for picky eaters. Ree also provides readers with food preparation tips, and comprehensive lists of what to stock in the fridge, pantry, and freezer. A few of my favorites are Sausage, Potato and Kale Soup, Cajun Chicken Pasta, Salisbury Steak, and Chicken Enchiladas. They are too good to pick just one, of course! This book would be a great gift for anyone who loves to cook, or would like to start cooking, as the recipes are easy to follow and the ingredients easy to find. Or, you can gift it to yourself! Either way, you won’t be sorry and you’ll love it!